I love love love summer. It’s the best time of the year here in upstate new York, and we spend a lot of time outdoors entertaining family and friends. Sometimes we will go all out and do something fancy for a special occasion, but most of the time I go for simple and easy. I like it to look cute, but I also want to be able to set up and clean up in a short period of time, so I can spend more time enjoying the gathering. There are a few items that I always have on hand that make a difference, and today I’m sharing with you my 5 Tips for Easy Outdoor Entertaining! You don’t need a lot of time or fuss to create a beautiful table setting and outdoor space! 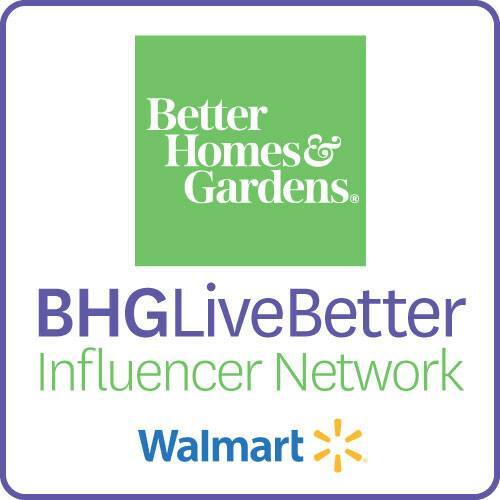 I love being a brand ambassador for Better Homes & Gardens at Walmart, and using their products both inside and outside my home. This is a sponsored post, but all opinions are 100% my own! My favorite investment last summer was in patio furniture for our back patio. It gives our family of 8 a place to sit and eat dinner throughout the summer and into the fall, which we absolutely love to do nearly every evening. In addition to the farmhouse table and industrial chairs, we have a farmhouse conversation set that can set 4-5 more people. 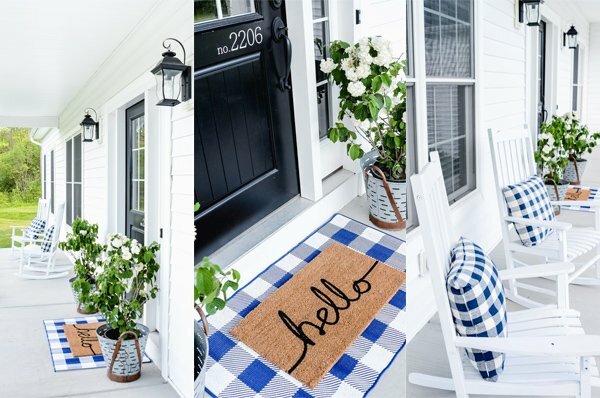 Having a place for everyone to gather is the number one place to start, and I chose these items because they were super cute, high quality, and a really reasonable price. The farmhouse industrial chairs are my most favorite…I have them both inside and outside, and they are not only durable, but also the perfect farmhouse style! We use paper plates a lot during the summer, and that’s definitely the easiest when it’s a quick dinner for our family. Sometimes we’ll use something different, but when we have guests, I like to fancy it up a little. Since it’s outside, I need something more durable…in case they get dropped on the hard stone or cement patio. I love the melamine plates by Better Homes & Gardens, especially this darling medallion set that comes in both salad and dinner sizes. At $6.99 and $9.99 (salad and dinner) for a 4-pack of plates, it’s an unbeatable price for the value! Mason jars are always my go-to for drinking glasses. They’re so adorable, and I always have a bunch on hand. With a few paper or plastic straws, they add to the overall look of the table, and add a ton of charm. To add another layer of color and texture, I add in napkins–this time navy gingham was just the right touch for the medallion plates. So simple and adorable–I can set this table and be ready for guests in just 10 minutes! When you’re setting an outdoor table, a centerpiece brings everything together, and brings charm and beauty to the table. Flowers are the perfect choice for summer, and always appropriate. There are so many beautiful flowers to choose from, and whether you pick them from your yard, get them from your local farmer’s market, or even the grocery store (this is where I find mine for a steal! ), when you place them in mason jars (my personal favorite), pitchers, or vases, they’re simple and summer perfection. I also love love outdoor lanterns, and they’re so cute on the tables and sitting on the patio next to the chairs or steps. Having a few versatile serving pieces on hand that you really love will make a huge difference in making outdoor entertaining easy. I have a whole collection of galvanized serving pieces that I found at Walmart by Better Homes & Gardens, and I adore every one. Can you believe this galvanized tub was less than $8? So affordable…and adorable! I love filling it with ice and bottled or canned drinks, and then guests can get them at their leisure. Other favorites include drink dispensers, trays, and serving trays that work so well for BBQs, parties, and more. Simplicity is my mantra. Having a beautiful table setting and entertaining space doesn’t have to take a lot of time, or take you away from enjoying your guests. It means you can entertain more, and not worry about feeling like there will be so much work you won’t be able to enjoy it. It really can be simple and quick, and you don’t need to have a lot of decor or extra things to make it beautiful. I was able to put together this whole setting in less than 15 minutes, which proves with a few key pieces, mason jars full of flowers, and yummy food—you can have simple, summer perfection!